7, Chelmsford Road is just another house in the capital. On the ill-fated day of 17th February 2002; Nitesh Katara a young executive was kidnapped, and battered to death with a hammer before the body was burnt. This heinous act was carried out by Vikas Yadav (along with his cousin Vishal Yadav); son of U.P. mafia turned politician D.P. Yadav. Interestingly, Bharti Yadav, daughter of D.P. Yadav proved to be an important link in the whole scenario. The motive and intention of killing has been crystal clear since the day of the crime. 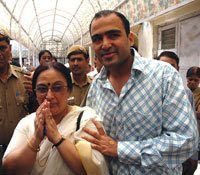 Both Nitesh and Bharti were in love with each other, a relationship not approved by the Yadav brothers. However, this was proved only today in the court of law after a consistent war against the mafia, which committed the crime and then tried to shield the culprit for as long as it could. It has been more than 6 years for this dark tunnel of injustice to discover the bright sunshine. Money, Muscle and Power were used each day to delay the proceedings of the honourable court. On quite a few occasions and even recently, certain actions were deliberately performed to deviate the attention of the court. All this while, Neelam Katara stood like a strong pillar not only in her own case but also for the cause of score of other cases like Jessica Lall and Priyadarshini Mattoo; apart from her own Kashmiri Pandit Community. She never hesitated to voice her opinion against injustice, and to stand up for her idealistic child Nitesh was always a top priority. "He was a fearless warrior; always ready to help and speak out for justice"; she recalls. It hasn't been an easy journey; Katara's suffered hell in last 6 years. She ran from pillar to post to shift the proceedings of the case from the Ghaziabad court to the Delhi District Court. Official records say, that Neelam Katara was present in all 400 hearings of the case. Need I say more? Neelam Katara, wiping her tears as the verdict was served, remarked, “"He would be happy wherever he is." The relief and satisfaction were visible on the brave face. Nitin Katara, Nitish's younger brother summed it up well when media persons congratulating him on the verdict day stormed him. He said, ""I believe he (Nitish) died for love. He died for freedom of expression, he died for that school of thought...in our generation that we are allowed to make a choice and stand by it and that belief has been vindicated today by this decision." "My mother is my God," he added. I later met Nitin and his mother while leaving the court complex. They gave me a warm hug, as if I am their own family, and I in turn was all excited to share this moment of long dreamt happiness. I, like always, applauded them for their indomitable zeal and conviction, which has made this, dream a reality. "The fight is on…" they concluded; as they left the Patiala Court premises today. And, the fight is on indeed…Satyamev Jayete! first n foremost CONGRATULATIONS Adi n all those who beleived that justice can b delayed n not denied..
hopefully we see more cases whre justice triumphs over muscle n money power.. amen.. satyamev jayetev.. I cannot even begin to imagine what a mother goes through when she loses her child and then to go thru the pain of knowing that he met a violent death and the people responsible are living their lives like nothing ever happened. Death of someone close to your heart changes you in so many ways but it is really commendable that Mrs. Katara, even after going thru so much pain and such a big loss showed the courage to fight the system and get justice for her son and all the other people like Aditya and others who have been fighting relentlessly the unjust system. Keep up the good work- Varun and God bless. you know, dear adi, i once saw these words inscribed over the immense barrel of a tank of our army....and it was a hair raising feeling, much better than the outer exhilaration of the 'ride' someone had so graciously arranged:) so too,warriors come in all forms....hmmmm. God bless you , our wandering child warrior. Satyam ev jayate! Somehow these words had been lost in the present day world, but it is glimmers of hope like this which make this word reappear again. I don't remember the last time I had seen these words.... I guess there haven't been much contexts in the recent times for these words to appear. justice was delivered finally but i feel the death sentence would have been more befitting for such a heinous crime.the defense lawyers' plea that the convicts are young and hence mercy should be shown makes me seeth in anger..those antisocial men with no remorse whatsoever did not deserve to be left alive.seeing mrs katara on television all these years with her undying spirit and courage should serve as an example for all of us to fight unto death for justice against the chronic relentless corruption and crime ravaging our country since eons.long live democracy. In the end, persistence always pays and am just thankful to the almighty and everyone involved in the struggle that they did not sit with hands folded at the gruesome act committed in 2002. People like the Yadavs in this case need to be shown that they cannot just do anything and get away with it. I hope they spend the rest of their lives in jail and think about what they did.